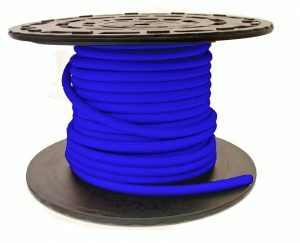 Push-Lock Hose, or (Push-On hose) is versatile, oil resistant, and requires no clamps to assemble when used with special push-lock fittings. It is offered in various colors for easy identification. The silicone-free tube will not contaminate the fluid conveyed. Flame resistant cover is MSHA approved. Push-Lock Hose can be used in the low pressure transfer of oils including ethanol, diesel and gasoline. Dedicated service hoses are compatible with B20 bio-diesel. Eliminate the need for clamps and tools by using push-lock hose and push-lock couplings. * Warning– Only push-lock hose and push-lock fittings used together can be assembled without hose clamps. Hose may be used with standard couplings when used with hose clamps, however do not use clamps with push lock fittings as the special serrations are sharp and can gouge into the hose tube. 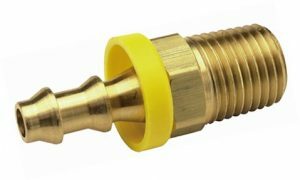 Push-lock fittings can be identified by a brass or yellow plastic circular ring around the hose barb (see photo below). The yellow plastic or brass cap means that the coupling is designed for push lock hose use. Please contact us for a variety of push lock hose fitting styles including swivels, elbows, and special thread.